Our heavy-duty custom round mesh tarps will keep you cool on the sunniest days. Stand in the shade with UV-resistant mesh while the sun beats down - you won't mind! Mesh tarps are perfect for covered areas - water won't pool during a storm. Get Ready for the Wind! If you've ever fought with a tarp on a windy day, you'll know the advantages of mesh tarps. Wind passes through, so they make great privacy screens on chain-link fencing - tight mesh keeps prying eyes away. 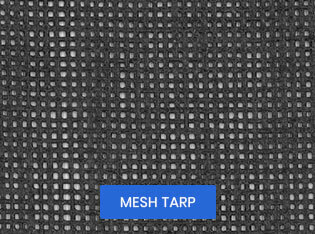 Our mesh tarps are guaranteed for two years, and why not? They're abrasion-resistant, mildew-resistant, and sewn with triple-thick hems - our quality materials make it easy to guarantee success! Order a custom round mesh tarp and keep the wind at your back!